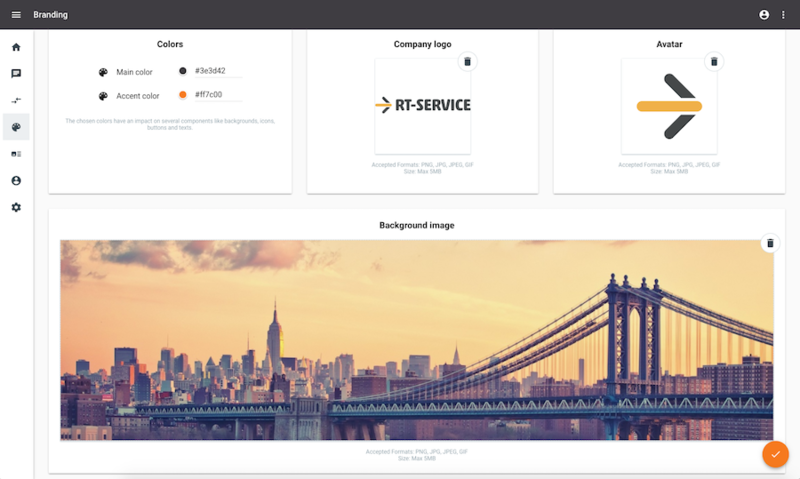 It is here in Branding tab where you can upload a company logo and avatar, and define the colors (both main and accent) displayed in the self-service portal used by customers. By selecting the + icon, you can select the company logo to displayed in the self-service portal. Accepted formats include: PNG, JPG, JPEG, GIF. By selecting the + icon, you can select the avatar to be used to represent your company in the self-service portal. The main color is used for the portal header. Using the color picker, you can select the main color or enter the HEX, RGBA, or HSLA value associated with the color. The accent color is used to outline the fields and messages contained in the portal. You can also give your self-servie portal a personal touch by adding a background image.